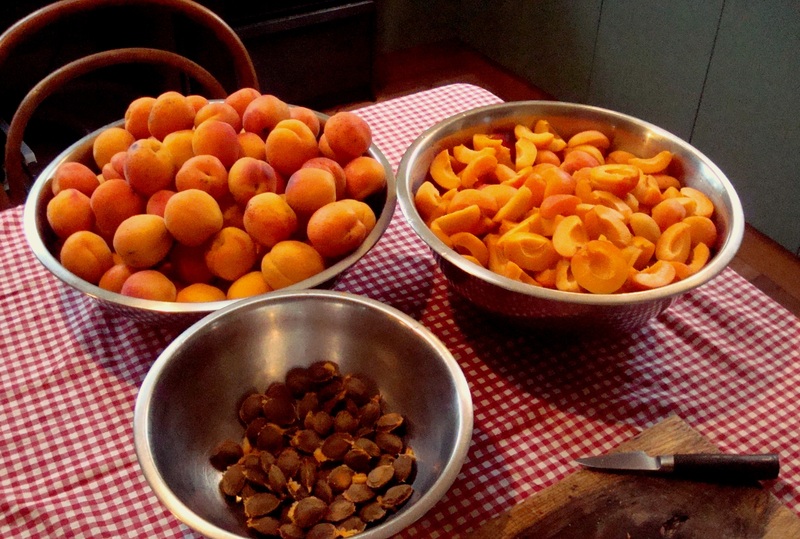 The apricots are beautiful and sweet at this time of the year in Dunedin and I am preserving as many as possible. Never throw the kernels away as it is a wonderful flavoring for Amaretti Biscotti, Amaretto Liqueur, Almond Extract for cooking and Almoncello ( a liqueur I make similar to Limoncello, but with Apricot Stones). Apricot kernels are used to intensify the flavor of almonds and have been used for hundreds of years. A little goes a long way. Yes they contain some cyanide, but are not dangerous unless a lot is consumed. Do not eat them as snacks like one would eat almonds for instance. There are a lot of unsubstantiated claims that it cures cancer as well. Recipes for cakes and drinks when I start using the kernels! Wash and quarter the apricots. Put 3 Kg Apricots, 2.5 Kg White Sugar and 200 ml Lemon Juice in a large pot and boil slowly. Do not add water. It may be difficult in the beginning, before the sugar has melted, to turn the mass over, but be careful and turn it over frequently without damaging the fruit or letting the sugar burn at the bottom. As soon as the sugar starts to melt it is easy to stir. It is easier to use a larger pot than a smaller one. Boil slowly for half an hour, stir frequently and skim off the scum. Turn off the heat and let it rest for at least 12 hours for the flavors to amalgamate and intensify. Boil again slowly while continuously skimming off the scum. When the jam reaches the correct density using the Freezer Setting Test, turn off the heat. Bottle as soon as the jam is cooler and easier to handle. Seal the containers and sterilise with the Hot Bath Method. Freezer Setting Test – Place a small plate in the freezer for a couple of minutes. When well cold remove from the freezer and put a teaspoon full of the jam onto it. If it is the correct consistency after a minute the jam is ready. If it is still too runny, simmer some more and repeat test later until jam is ready to be removed. Hot Bath Method – Sterilise bottles of jam by submerging them into water in a large pot (bottles must be completely covered by water) and boil for twenty minutes after the water and jam bottles commenced boiling. Remove and let cool.